Measure the TSH levels in your body during conception tries and especially during pregnancy. Cost per test: 3.33 €. 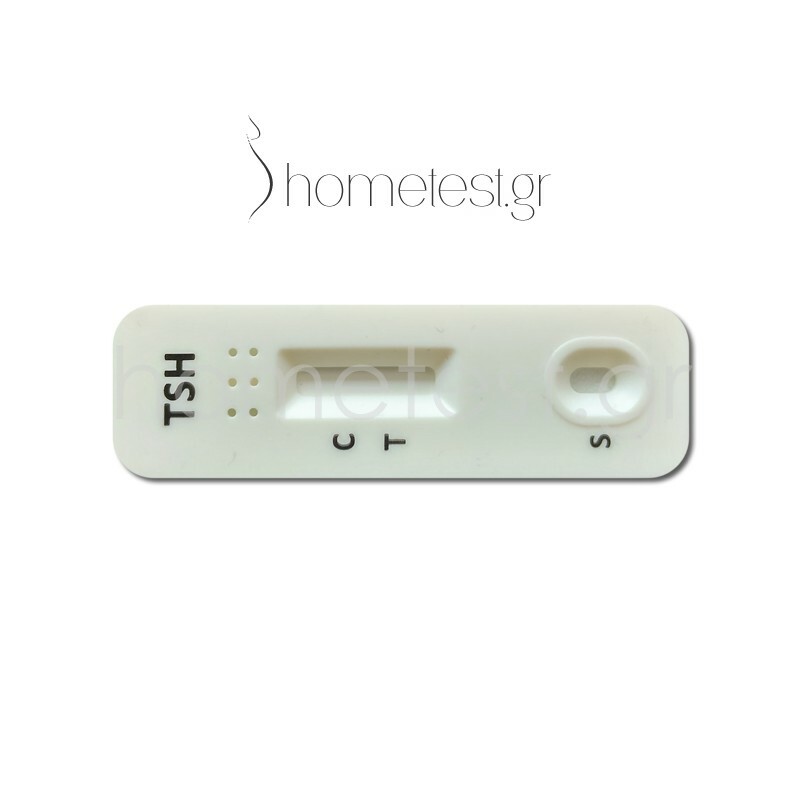 The HomeTest thyroid (TSH) test is an extremely reliable and absolutely safe chromatographic immunoassay test for the qualitative detection of thyroid stimulating hormone (TSH) in the blood. It is not indicated for use screening neonates for hypothyroidism. What is thyroid stimulating hormone (TSH)? Thyroid stimulating hormone (TSH), or thyrotropin, is the primary regulator of the functional state of the thyroid gland. Its production and release is stimulated by the hypothalamic thyrotropin-releasing hormone (TRH) at the pituitary gland and possibly the hypothalamus and is controlled by the levels of the thyroid hormones (thyroxine-T4 and triiodothyronine-T3). TSH levels increase in cases of primary hypothyroidism. The diagnosis of hypothyroidism is done by finding a low total or free T4 value and is confirmed by an elevated TSH level. Mild primary hypothyroidism may be more difficult to diagnose by measuring the level of total and free T4, because the total and free T4 may sometimes be within the normal range. In these cases, TSH tests are useful for diagnosis, as TSH levels are increased. In hyperthyroidism, levels of T3 and T4 increase and the level of TSH is decreased. This test can not be used to check for hyperthyroidism. Thyroid may have a dramatic effect on a huge variety of body functions and if you are a woman over 35, the chances of thyroid disorder are higher than 30%. Women are 10 times more likely than men to experience a thyroid problem. 1. You are constantly exhausted or hyperactive. 2. You have gained or lost weight, without changing your eating habits. 3. You are having difficulties getting pregnant. 4. Your nutritional preferences suddenly changed. 5. It is not easy to concentrate or it is difficult to remember old events (brain fog). 6. Have low sexual desire. 7. Do you feel that your heartbeat is often unstable. 8. You have dry skin. 9. You regularely have intestinal disorders (constipation or diarrhea). 10. Your menstrual cycle is "unstable". 11. Sudden pain or tingling in the limbs without a reason. 13. You feel colder or warmer than the people around you. 14. You notice a swelling at the front of your neck. 15. You have sleep disorders (you sleep for many hours or wake up in the night and can not sleep again). 16. Your hair is thinning or falling. 17. You have high cholesterol. Diagnosis of a thyroid disorder may be a difficult affair and you should always consult a specific endocrinologist.